This is an exquisite quality example with well-defined 'bar code' markings. It is a growth interference crystal and has a tiny light-bearing rainbow at its heart. Due to their extraordinary history, many are also 'Warrior Crystals' - ones which have acquired small nicks and chips throughout their fascinating journey. This one, however, has a flawless tip with just a miniscule 'graze' along one edge. It has the perfect balance of male and female energies with a clear tip and milky base. These beautiful and most powerful of lightworker's tools yield many secrets and perhaps the new owner of this particular crystal will be able to shed some light on these mysterious markings? 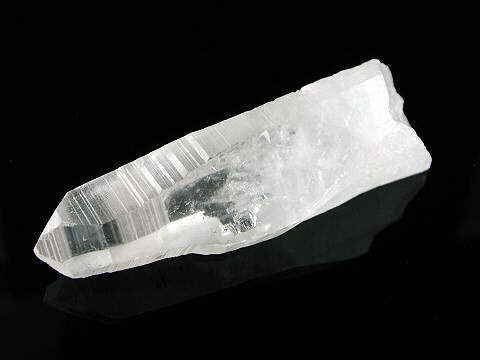 Lemurian Seed Crystals are found only in the Sierra Do Cabral mountain in Minas Gerais, Brazil. These naturally formed crystals were discovered in late 1999/early 2000, placed individually in a sand bed, and were not attached to clusters. Some, but not all, carry a pink to reddish glow, others are brilliantly clear and some have phantoms, rainbows and inclusions, record keepers and keys. Although a few have been polished to reveal their inner beauty, all genuine Lemurian Seed Crystals found in the sand bed were natural unpolished wands. Legend has it that Lemuria was a peaceful and highly developed spiritual civilisation, believed to exist on earth over 12 million years ago. During the last days of Lemuria, it was decided to plant seed crystals programmed to transmit a message of oneness. Having seeded the crystals, the Lemurians, it is believed, left this planet for other star systems. Others went into inner earth (while maintaining telepathic connection with those in other parts of the galaxy), where they continue to care for the earth and the seed crystals now surfacing. Lemurian crystals are attracted to people who will actively assist in enhancing the energies that aid the planet. It has been said that Lemurian crystals are the perfect stone for opening the heart. They put one in touch with the purity of innocent emotions and enhance one's intuitive gifts. Great for removing energy blockages and opening to Divine love and Compassion. Lemurian crystals are connected to inner earth, the earth's surface, and the stars, and serve as links to these various magnetic fields. On the individual level, each seed crystal is energetically connected to all other seed crystals. Their clarity often extends far into the shaft. Many of these fascinating and enigmatic crystals contain ‘bar-code’ type striations along the shaft, which are believed to contain implanted information left by the original guardians of these stones, and it is said that by sitting quietly and meditating whilst gently rubbing these striations, you may be able to unlock some of their wonderful secrets. Note: By the beginning of 2004 the sand bed where these most unusual crystals were found in Brazil, had been emptied. All of the crystals have now been gathered and are being re-homed across the globe. Availability is, therefore, limited and genuine Lemurian Seed Crystals are becoming harder to locate. However, all Lemurian Seed Crystals offered for sale on this site are bought from trusted sources.